While there are notable new features in Windows 10 1803 that get a lot of attention, here’s a look at helpful features that fly under the radar. The Windows 10 1803 April Update has many notable new features like Timeline and improved privacy settings. But at the same time, there are lesser-known new abilities in the OS you might not be aware of. Here is a look at some of the minor changes that you can explore after you’ve updated to the April 2018 Update. Typically, when an app isn’t responding, and the window won’t close, you would hit Ctrl + Alt + Del to launch Task Manager, right-click the offending app and choose to end task. 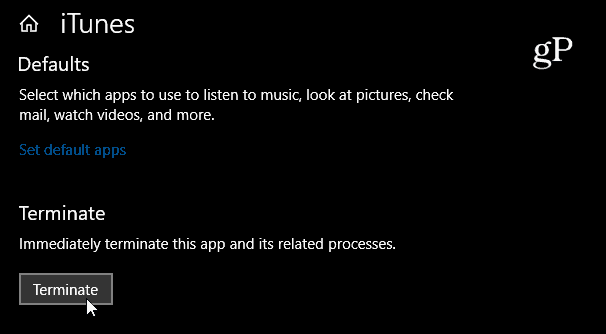 While that still works, Microsoft has added the same functionality to the Settings app. Head to Settings > Apps > Apps & features. Click on the offending app and choose Advanced options and then click the Terminate button. While Microsoft apps on Windows 10 tend to scale well on different displays, third-party apps don’t always look the best. It seems to happen a lot on older programs on high-resolution displays. Many times, the problem is the text within an app is blurry and hard to read. 1803 has a new feature that can help alleviate the problem. 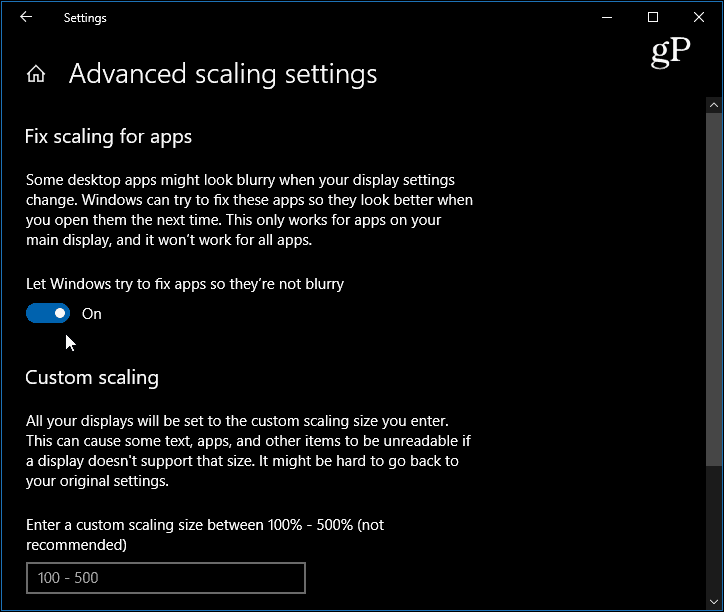 To fix a blurry app head to Settings > System > Display > Advanced scaling settings and flip the “Let Windows try to fix apps so they’re not blurry” switch to On. The Notebook section in Cortana now puts Lists and Reminders up front for greater priority. The Notebook page now features two tabs called “Organizer” and “Manage Skills” which makes navigating through the digital assistant a bit easier. The Organizer tab comes up by default and it displays your lists, Reminders, and suggested tasks. 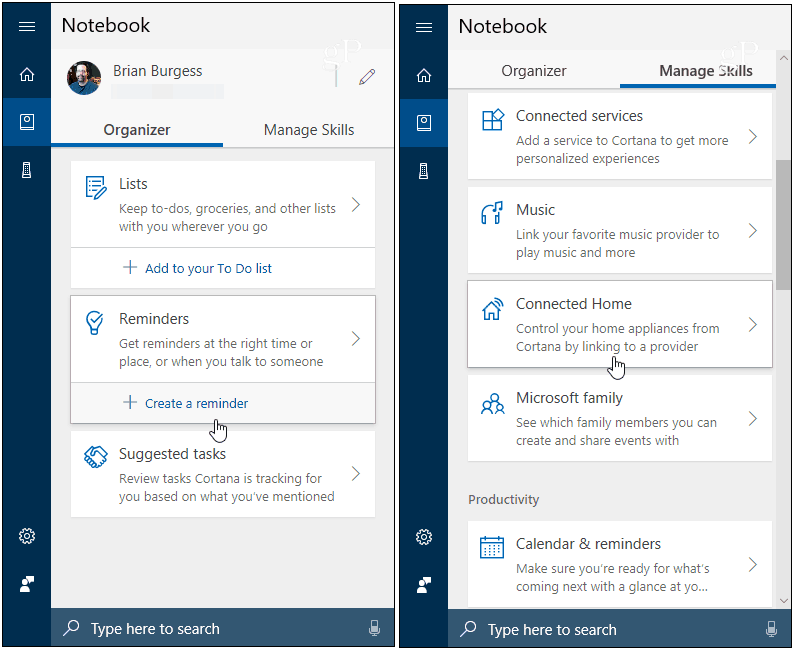 The Manage Skills tab includes the rest of the Notebook tools where you can manage things such as Cortana Skills, setting up Smart Home devices like the Invoke speaker, connecting music and other popular online services, Calendar settings, and other Cortana settings. Some of the other new features you might want to check out are things like Nearby Sharing – to wirelessly transfer files between devices. And the new Focus Assist for distraction-free productivity, or the Diagnostic Data Viewer to review and delete telemetry data. Also, take a look at what’s new in the Setting app as Microsoft is moving more system tools away from the classic Control Panel — including new Sound settings. And while we pick up major and minor new features with each new feature update, we are seeing some of the legacy ones being removed. For more on what’s no longer around, read our article on what’s been removed in Windows 10 1803. Let us know what some of your favorite new features are. Or, if you’re having problems getting things to work correctly, head to our Windows 10 Forums for more discussions and troubleshooting advice. Seems the list of ‘Apps’ in Setting, isn’t ones necessarily running but is just a list of all installed apps.